At the 2018 NAB Show, Video Clarity will launch the new RTM Manager with automated file QoE, a new configuration of its RTM realtime audio and video monitoring solution. Many files get passed into distribution that either cause a loss of video quality or have audio problems that file-checking routines are sometimes not equipped to catch. Built for postproduction and file delivery centers that handle all kinds of content — such as for broadcast, cable, IPTV and OTT program delivery — this new RTM solution’s automated measurement process tests HD and SD video faster than real time to accelerate the test time per file of both long- and short-form programming, then presents results and errors for review. The RTM Manager browser interface gives users easy access for setup and testing feedback, while the ability to automatically test multiple files in a series limits the amount of necessary human intervention. This new solution applies the RTM Manager browser controller to new RTM system and software models at no extra charge, starting at the 2018 NAB Show. Existing customers’ RTM systems or software may be optionally upgraded for $2,995. On display at the 2018 NAB Show will be Video Clarity’s Venue Player IP, a new version of the company’s video server that automatically plays multiple uncompressed segments of content to multiple screens in precise timing and sequence. With the advent of interfaces for uncompressed video on Ethernet, what was previously an SDI player and recorder or DisplayPort player is now optionally available with a 10G ethernet interface. The new version applies recently developed and standardized media flows for playing video and audio according to SMPTE ST 2110. With Venue Player IP, video engineers in places such as sports stadiums, exhibit centers, live-show venues and theme parks can build a media distribution network with IP and then control it over the same network, effectively eliminating the dedicated, point-to-point video and audio distribution networks of the past. Having the flexibility to use fiber rather than coaxial content-distribution methods with application, source, and control modification functions over ethernet helps venues meet the demand for transporting video with ever-higher quality and resolution to ever-larger screens. Facilities benefit from being able to implement standardized infrastructure with Ethernet and apply uncompressed video routing of real-time uncompressed video signals — a capability that has only just now become available. Visitors to Video Clarity’s booth at the 2018 NAB Show will be the first to see RTM IP, a new model in the line of RTM realtime audio and video monitoring solutions and the most accurate real-time audio and video quality measurement device available on the market today. Using only gigabit ethernet and 10 gigabit ethernet IP interfaces, RTM IP is able to run automatic, full reference, real-time quality testing in the IP domain for uncompressed and compressed video quality streams. It works by playing a test reference source into the network while performing a comparison of that source to downstream processed video and audio. The system enables program originators, service providers, and manufacturers’ test labs to apply RTM testing to IP networks, and importantly, to do it using the new SMPTE ST 2110 media flow technology. Whether they need to measure the quality of output delivered to a downstream channel or to home viewer, or they’re taking measurements during R&D and product development, users can test the performance of their network video-processing functions automatically and in real time without setting up recordings. This time-saving feature lets users focus on other work while the quality-monitoring and logging test is underway. RTM IP is available as new model RTM-S2043-IP and as a software option for ClearView IP systems that have 10G IP interfaces. 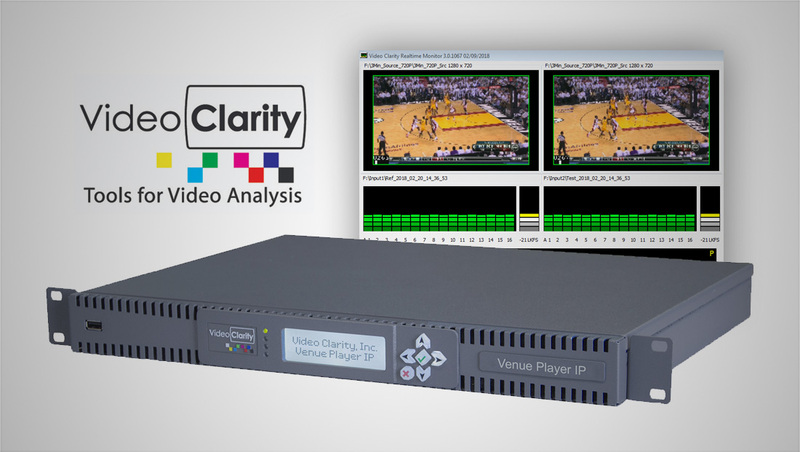 At the 2018 NAB Show, Video Clarity will introduce ClearView 9.0, the latest software release for its ClearView line of video quality analyzers. Driven by customer input, version 9.0 boasts several new features that help day-to-day users save time and get more utility from their existing ClearView systems. One major update is NIQE, a new high-performance, no-reference metric that provides accurate quality measurement when a source reference is not available — as is often the case in today’s cloud-based delivery workflows. By adding NIQE to ClearView’s selection of measurements, Video Clarity has reached a milestone for its measurement tools. It is now possible for program originators and secondary home-entertainment delivery-service companies to evaluate video quality using no-reference tests on natural videos, with results that closely correlate to ClearView’s full-reference quality measurements. These same users will also benefit from two more new features in ClearView 9.0: 12-bit video image support and HDR signaling for HDMI on ClearView outputs. Support for 12-bit video is important for users who simply want to record, play, and review higher-bit-depth native content that is upstream of delivery methods — an option that was not available in ClearView until now. Similarly, integrated HDR signaling means program originators and service providers no longer need to use an external converter on HDR videos being played from ClearView systems for all HD and the lower 4K frame rate ranges provided by the ClearView native HDMI output.